Squid Sisters vs. Bloopers is an Event Course in Super Mario Maker, released on July 7, 2016. It unlocks either the Callie or Marie Mystery Mushroom costumes, depending on the route the player takes. The level begins with two doors: Callie's on the left, and Marie's on the right. Both routes give Mario the respective Mystery Mushroom of that character, along with a warp pipe that leads underwater. Both underwater routes are about the same, except for cosmetic changes to the coins, Bloopers, and Hard Blocks. 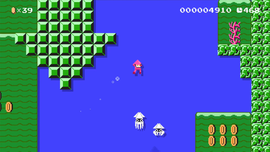 Both paths also lead to an area with Note Blocks, more Bloopers, and some block art made to resemble the squid form of an Inkling, leading to a Lakitu's Cloud. Mario must then follow the coins to the Goal Pole. This page was last edited on November 15, 2018, at 16:45.